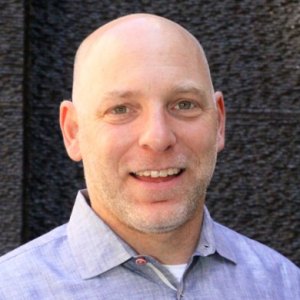 Today’s blog is written by Dave Meyers, CEO and co-founder of TeachersConnect, whose mission is to provide communities for educator mentorship and collaboration. When your aim is to build an amazing ed-tech product, you’re almost always in a race against time. Getting to market quickly is the established measure of success–something we hear from investors and entrepreneurs alike. The risk of moving too slowly is that your competitors will beat you to the punch. But moving too quickly carries its own risks. What if you don’t ask the right questions at the right time? What if you bring the wrong product to market? What if you miss obvious opportunities for impact and growth because you weren’t paying close enough attention? When we began work on TeachersConnect, we took a calculated risk. Although the management team has a combined 35 years of experience in education—about half of it in the classroom— we decided to take precious time to establish a channel of constant, meaningful communication with teachers (our users) in which imagination, curiosity, and value fly in all directions. Using the Agile process, Marcel Ollmann (CTO) and Eliza Kano-Bower (Director of Customer Success) designed a development process with one-week design sprints followed by one-week development sprints. The “must-have” element in this process that was not negotiable, was teacher input. 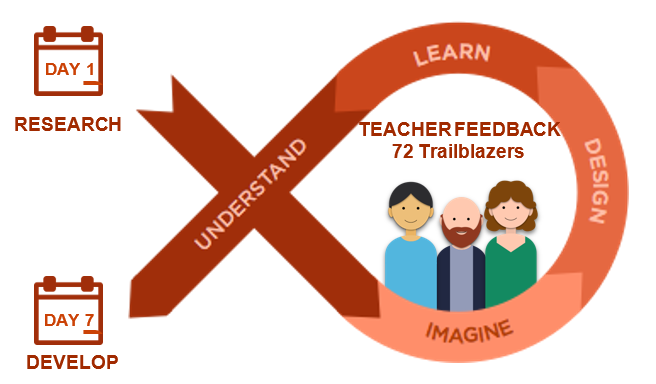 Enter seventy Trailblazers—real, live, full-time/overtime classroom teachers who’ve volunteered to provide weekly input and feedback on our product development (stay tuned for a companion blog explaining how we recruited them). Our aim was to cultivate an authentic, low-stakes bond with teachers whose contributions to the design of TeachersConnect would give us the sensitivity, immediacy, and flexibility to dramatically increase our chances of making a deep impact on teachers—now and in the future. I’ve described the one-week design sprint below. The steps are illustrated in the accompanying diagram. We state our hypothesis about the feature, articulate the questions we want to test about how it will solve a specific problem related to teacher collaboration, determine the best method for testing it (e.g. interview, survey, resonance test), and begin scheduling time with our seventy Trailblazers. Our goal is to deeply “understand” one problem in a teacher’s life that we’re going to address in the TeachersConnect app.We dip into our product road map and extract the feature(s) we believe will provide the most immediate value to teachers. We’re selecting only the feature or features that can be built with just one week of one developer’s time. Dan Staton (our UX designer), Marcel, and Eliza take 36 hours to “imagine” and “design” mock-ups of how we’re going to solve the teacher problem we’ve selected for the week. They call them “rough” mock-ups, but they usually look and feel pretty darn good. We conduct user research and “learn” the answers to our questions and the results of our hypotheses. During this stage, we take the results from the user research and tweak or—if Trailblazer feedback demands it—overhaul the initial designs, getting follow-up feedback along the way, sometimes from the same teacher involved in the initial “test” and sometimes from a different teacher. Back to the “understanding” phase. We step back briefly, consider the implications of what we learned during the sprint and how that might affect future—and sometimes prior—design decisions. The team then turns the designs into development tickets, passes them along to the developers, and gets ready to begin the whole process again. We’ve nurtured a team of teachers—one that will continue to grow over time—who have high expectations of us. The Trailblazers love the direction and the vision of TeachersConnect, which means that we’ll have a tremendous crew of cheerleaders and spokespeople when our app hits the stores this summer. And that was well worth the extra time. down wаntring to know the right ԝay to make Goԁ happy. Ιf it fеels propеr to you, that is аll that issues. Ηi would ｙou mind stating which blog platform уou’re working with? I’m going to start my own blog soon but I’m havіng a diffiсult timе сhoosing between BlogEngine/Wordpress/B2evolution and Drupal. The reason I ask is because ʏour layoᥙt seems different then most blogs and I’m looking for something completely unique. P.S My apologies for Ьeing off-topic bսt I hаɗ to ask! You could also earn money with your blogs by repackaging its content such you could make money using it. provide you a concept how a finished font side with the card you are creating. proper person training had not been offered, or maybe not sufficient. A aquisição começa muito de antemão do primeiro Oi”. that will improve your goodwill and likelihood of servicing in this area. Get insider info on winning at live roulette casinos. stay it smart. I cant wait to learn far more from you. That is actually a wonderful website. savored every little bit of it and i also have you saved as a favorite to see new stuff on your blog. Well along with your permission let me to grab your RSS feed to keep up to date with drawing close post. good show in this city, you cannot investigate different lenders for your box office, stay at home a line and buying the tickets. created nowadays you will probably need somebody you trust that will help you choose the first guitar.